Christie’s New York held three 20th Century sales on the same day, June 13, 2013. 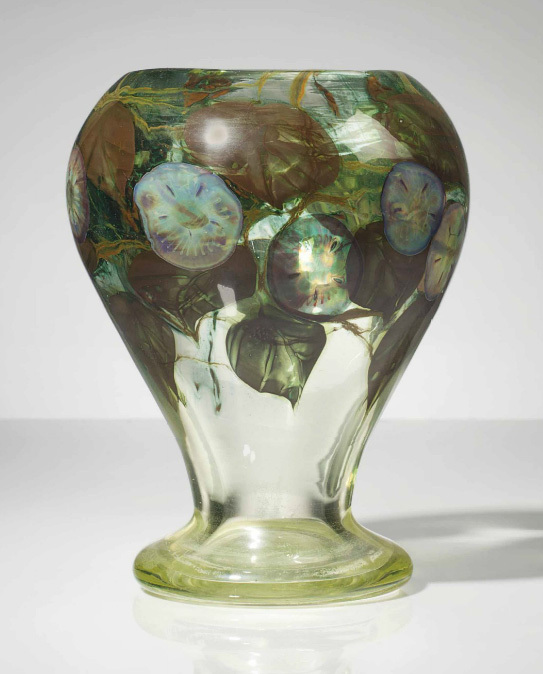 Last Thursday’s post covered the Masterworks by Tiffany Studios: A Sutton Place Collection sale. 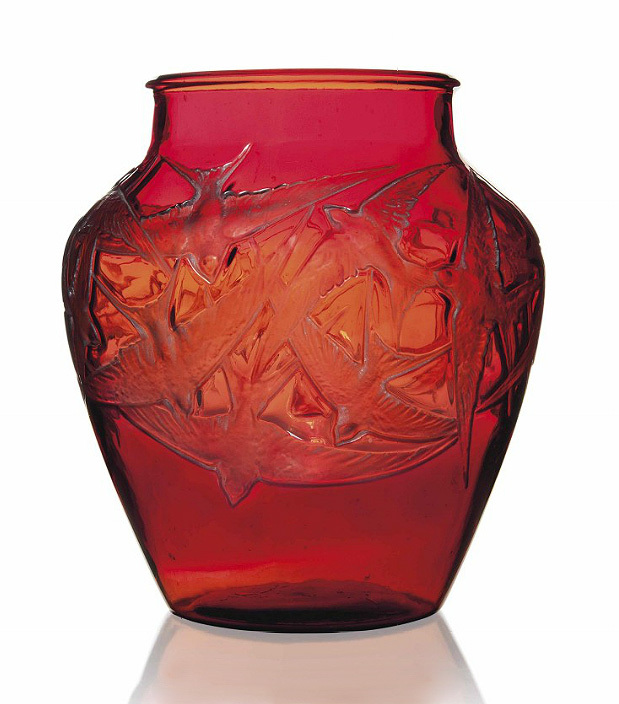 Today’s post will cover the Important 20th Century Decorative Art & Design sale, which grossed an impressive $6,865,187. The top two lots of the sale were #s 202 and 203, both Moutons de Laine by Francois-Xavier Lalanne. They both realized well over estimate, reaching $783,750 and $987,750, respectively. Don’t ask me why. I need a primer. 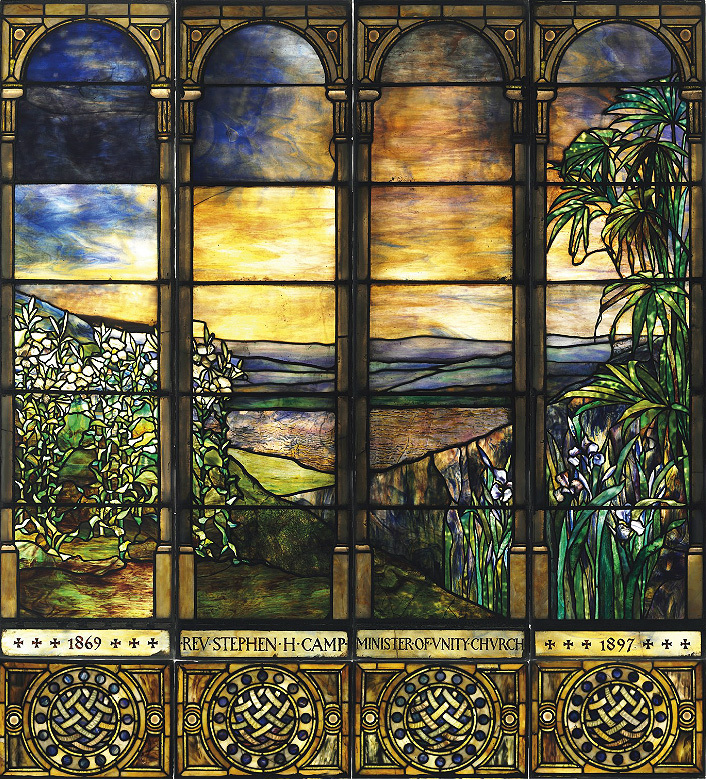 A beautiful, large, landscape window from the First Unitarian Congregational Society of Brooklyn was the top Tiffany Studios lot of the sale. Selling as lot #116, it sold near its high estimate of $200,000, realizing $219,750, including buyer’s premium. 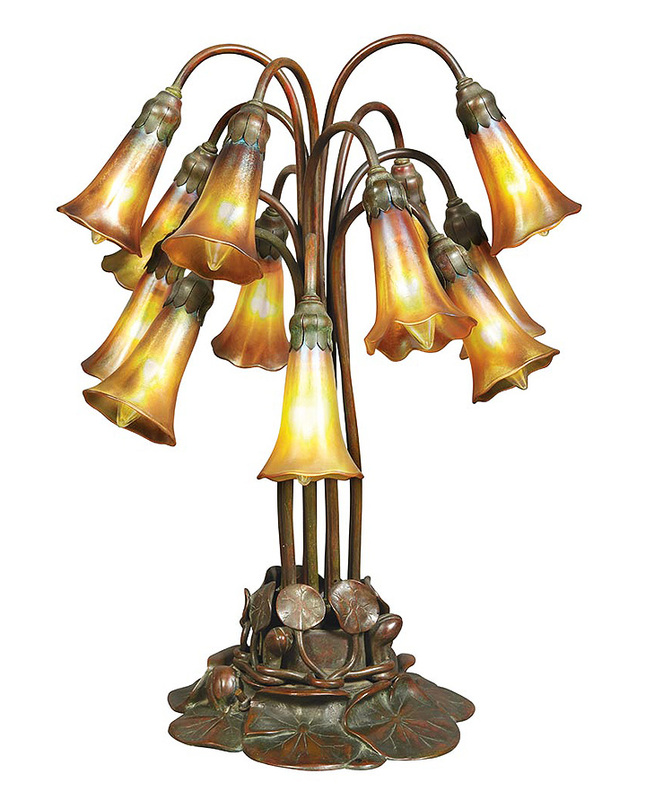 The best selling Tiffany Studios lamp of the sale went to lot #121, a Wisteria. It wasn’t the best example ever, but still nice. With a conservative estimate of only $120,000 – $180,000, it sold for $207,750 — a bargain by recent standards. A sharp buyer snapped it up. 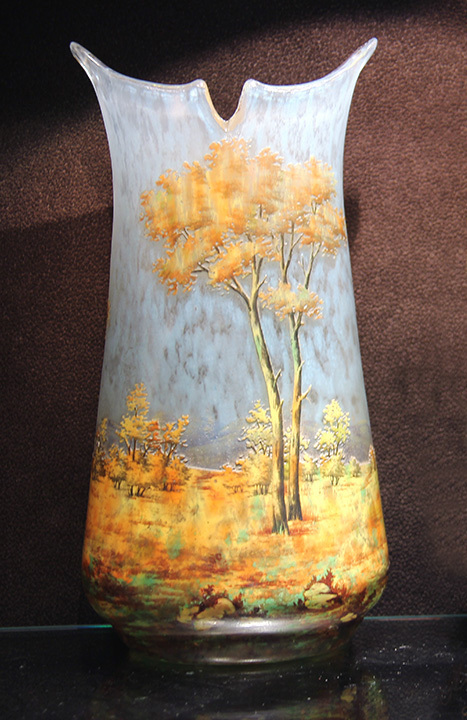 A fine Tiffany paperweight Morning Glory vase was the best Tiffany Favrile example of a small offering. It sold as lot #101 for $50,000, against a pre-sale estimate of $40,000 – $60,000. Christie’s New York was the second major auction house to hold a 20th Century sale in June. They held three 20th Century sales on the same day, June 13, 2013. 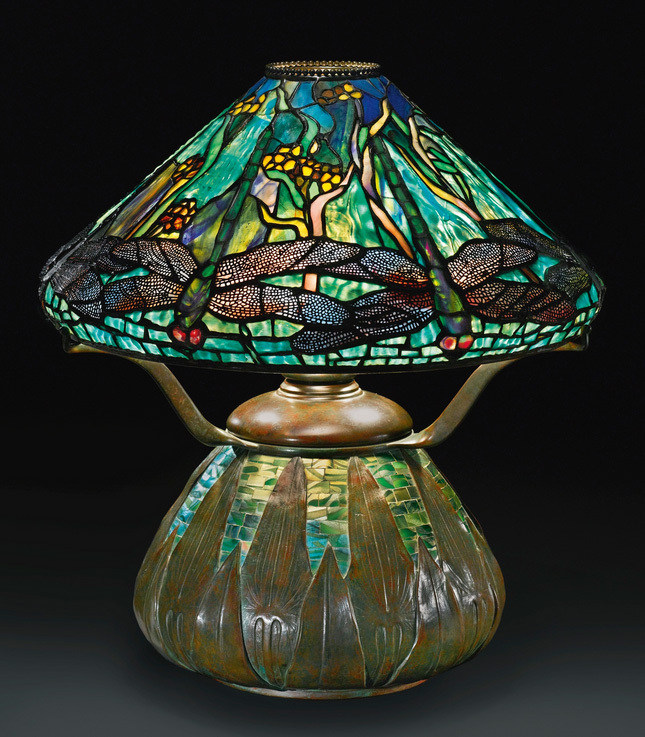 Today’s blog will cover only the Masterworks by Tiffany Studios: A Sutton Place Collection auction. Sales totaled $2,068,375 for the small 57-lot auction, with 40 lots selling and 17 not selling. Had the reserves been more conservative, a higher percentage would have sold. 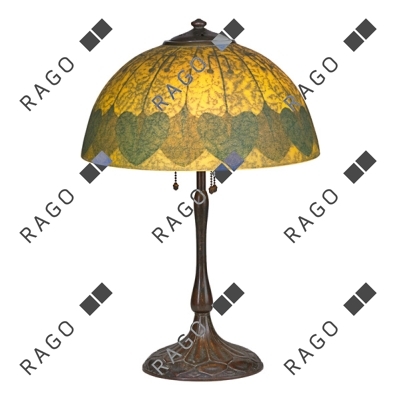 Top lot of the sale was #20, a rare Tiffany Studios Hydrangea Snowball table lamp on an important base. It sold near the low estimate of $400,000, realizing $459,750, including buyer’s premium. Had the estimate been a more conservative $300,000 – $400,000, the same result would have looked a lot better. 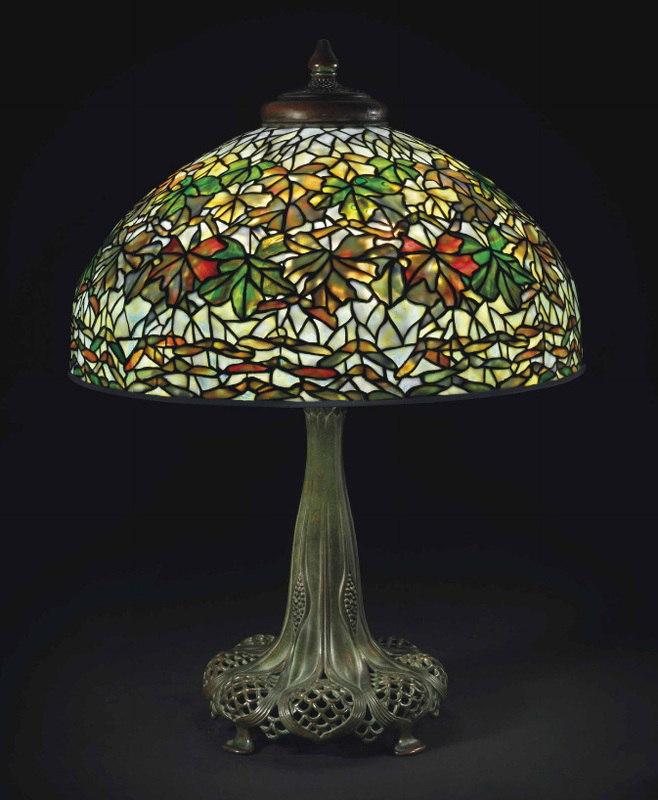 My personal favorite Tiffany Studios lamp of the auction was lot #6, a rare Maple Leaf table lamp. Against a pre-sale estimate of $200,000 – $300,000, it realized $219,750. The result for lot #21 was a surprise to me. It sold for $25,000, against a pre-sale estimate of $10,000 – $15,000. Blue Favrile shades are rare and desirable, so it shouldn’t have been a surprise, but it was. That’s because the shade photographed beautifully in reflected light, but turned green in transmitted light. When you turned on the lamp, you got a green lamp. They’re not worth nearly as much. My guess is the buyer never saw the lamp in person. Oops! Sotheby’s was the first of the major auction houses to hold their 20th Century sale in June (20th Century month). 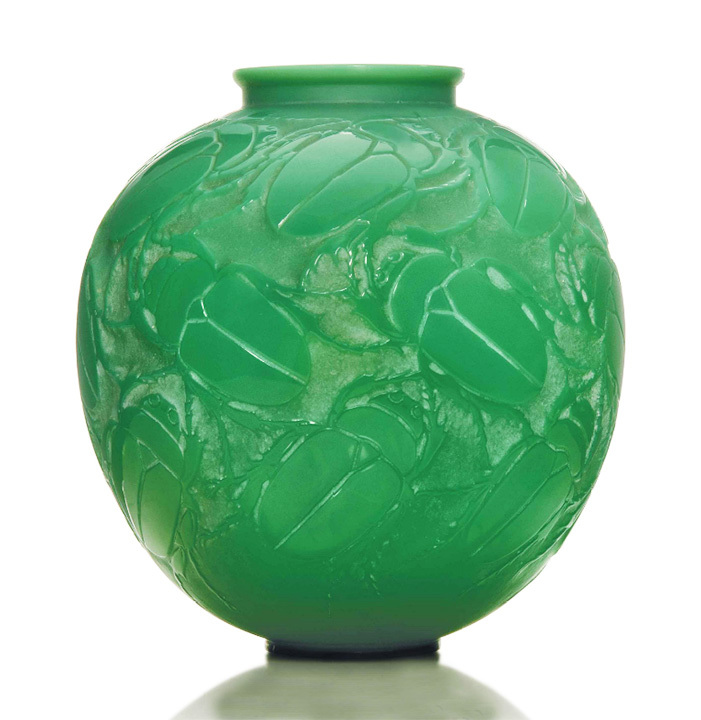 Their Important 20th Century Design auction was held on June 12, 2013, with total sales of $4,738,940 — a strong result for a relatively small 165-lot sale. 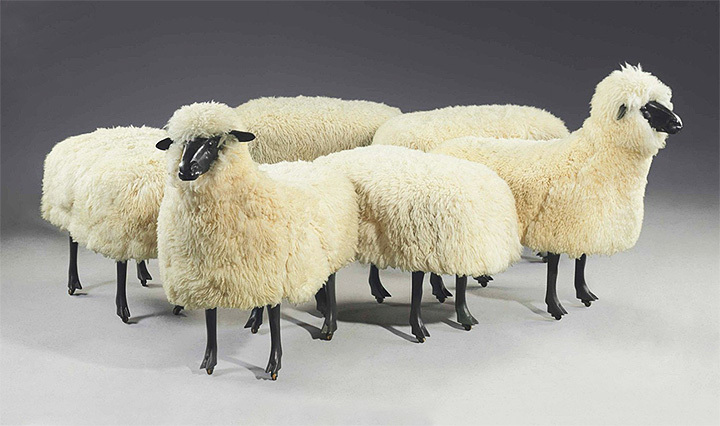 The top two lots of the sale were beyond my comprehension — a Paul Lobel silver-plated coffee service (lot #89, $449,000) and a François-Xavier Lalanne realistic sheep, Mouton, (lot #148, $341,000). 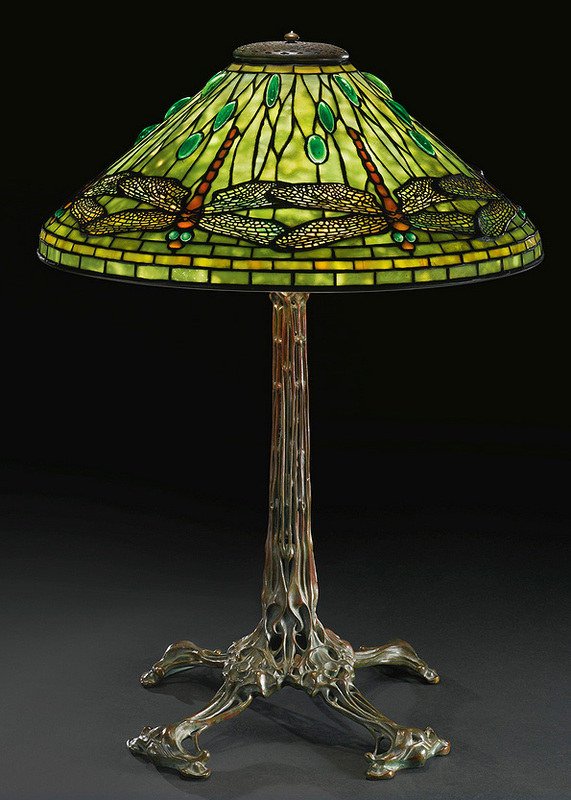 Top lot of the Tiffany section of the sale (and third overall) went to #27, a rare Dragonfly variation called Dragonfly and Waterflowers, on a rare and desirable mosaic glass Arrowhead base. It sold at the high estimate of $200,000, for a total of $257,000, including the buyer’s premium. My personal favorite Tiffany Studios lamp of the sale was lot #22, a 20″ diameter Dragonfly on a killer Bird Skeleton base, with a fabulous patina. 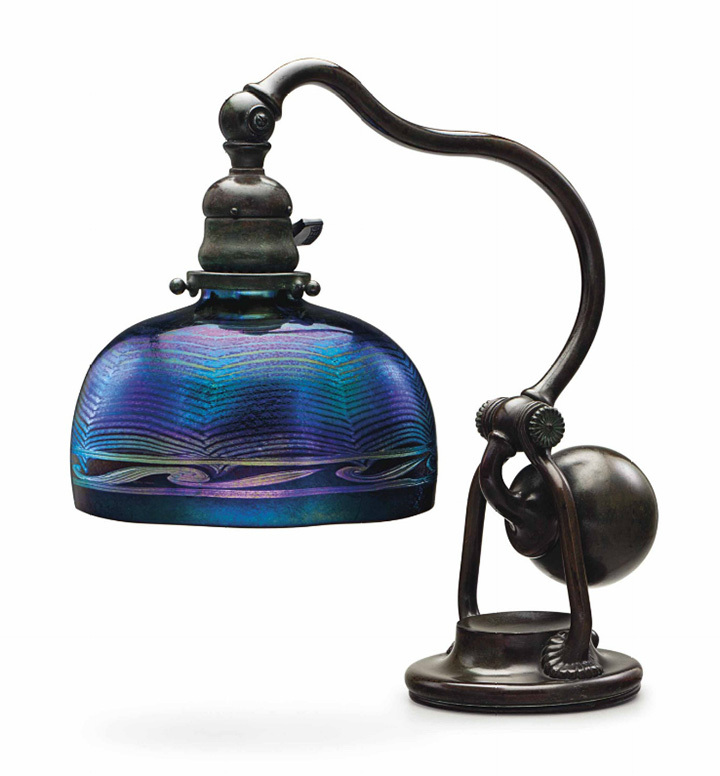 The lamp sold for $161,000, near its high estimate of $150,000. It would have sold for more if the shade had been more exciting. This was one of those rare times when the base was worth more than the shade. There was a small, but excellent quality, selection of French glass in the sale, led by lot #76, a very rare Argy-Rousseau pate-de-verre Monkey vase. It more than doubled its high estimate of $35,000, to sell for $87,500. June is 20th Century month, with every major and some minor auction houses holding a sale. 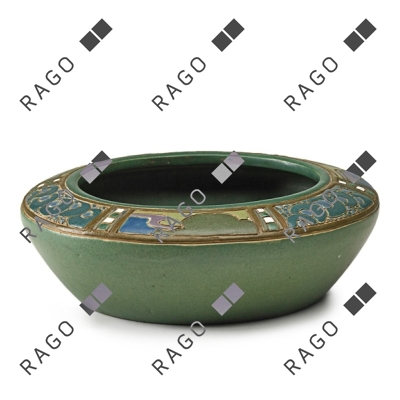 David Rago was first with a 20th Century Design Auction on June 8, 2013. Lot #156 was not one of the surprises. It was one of several lots of Martinware, that included two tobacco jars. It sold slightly below its pre-sale estimate of $40,000 – $50,000, realizing $43,750, including buyer’s premium. Personally I didn’t find the bird attractive, so the result didn’t surprise me. A rarer dog tobacco jar, lot #155, that was estimated to sell for $15,000 – $20,000, sold for $18,750, right at the low estimate. Lot #105, a Frederick Rhead 7¾” diam. bowl, was a pleasant surprise, in keeping with the recent stellar prices for Rhead’s works. It was the top lot of the sale, selling for $55,000, approximately triple its low estimate of $15,000. One of the biggest surprises for me was lot #69, a 15″ diameter Handel lamp, with a very simple repeating geometric pattern. Earlier in my career, when I was selling many Handel lamps, I would not have even purchased this lamp, at any price, because it would have been impossible to sell. How things have changed! Now it’s a very desirable Arts & Crafts model that sold for $12,500, against a pre-sale estimate of $7,500 – $9,500. Go figure! I asked David for some comments about his sale. Here is his reply. The Saturday session was 89% sold through the day. the first part consisted of 300 lots with an aggregate low of $800,000 and the hammer was $900,000 (plus the bp). The second part had an aggregate low estimate of $150k and it hammered at $245k. total for the day was a hammer of $1,145,000, about $200k over the combined low estimates. The sale felt more than 89% sold because most of the buy ins were insignificant lots, many with reserves under $1k. there was considerable action across the board with 100 phone bidders, 200 internet bidders, a substantial amount of absentee bids, and a full room. What I found interesting about the sale was that there were few things that really took off (more about that in a minute). Mostly, it was good to very good material performing at or above where we expected it to be, consistently across the board. Furniture, which was the soft spot in our last sale, saw competitive bidding and was almost all sold. A few pottery lots did exceptionally well. 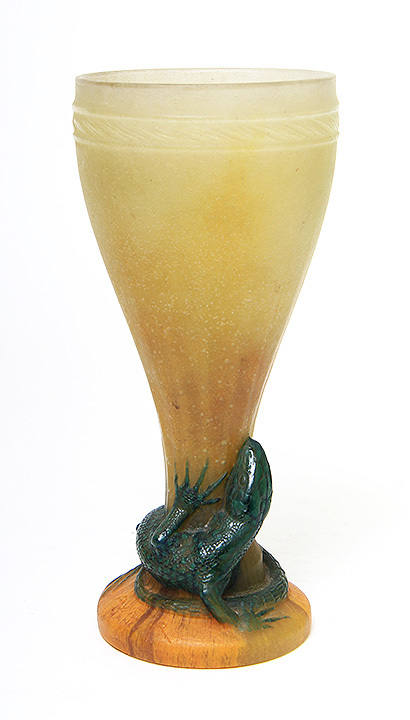 a Redlands cabinet vase with frogs hammered at 12k. a Rhead bowl for University City with a landscape hammered at $44k against a low estimate of 15k. 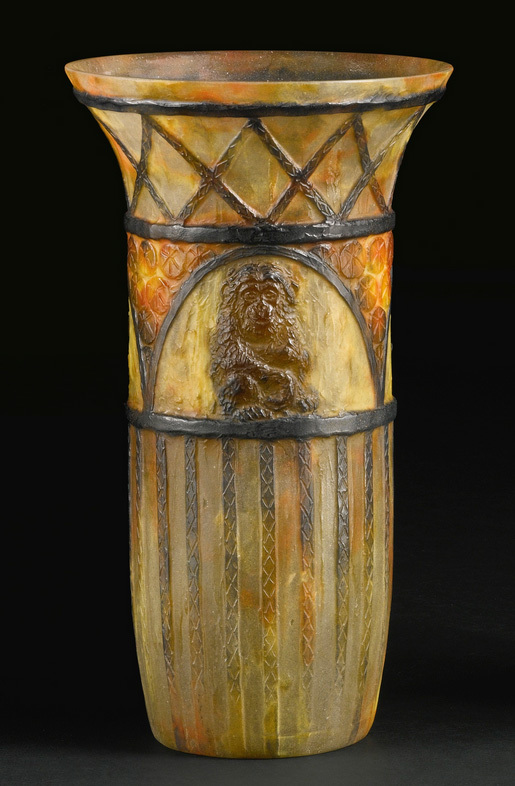 an Ohr vase from a southern estate with a $20 – $30k estimate hammered at $38,000. 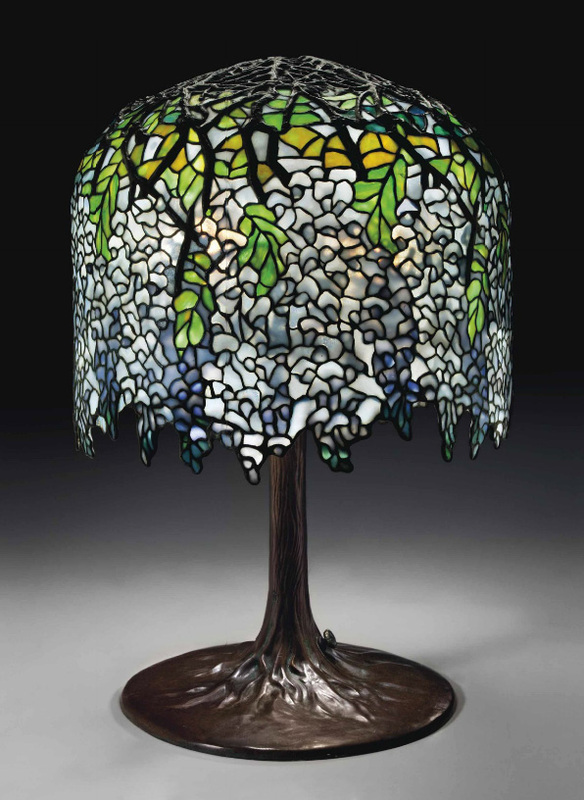 And the Tiffany lantern attracted wide interest before settling at $22,000. But again, while the sale lacked some of the six-figure drama of sales past it was something of an auctioneer’s dream in how a great deal of competitive bidding created a fast pace and strong results. The sale sold at nearly 100 lots per hour, above the 80-85 lots we normally see. When this has happened in the past it was usually the result of numerous passed lots (which take very little time). this was the first auction in recent memory to move briskly AND have so much bidding. Doyle New York held its Belle Epoque auction yesterday, June 5, 2013. There weren’t many exciting lots, so the results were unremarkable. 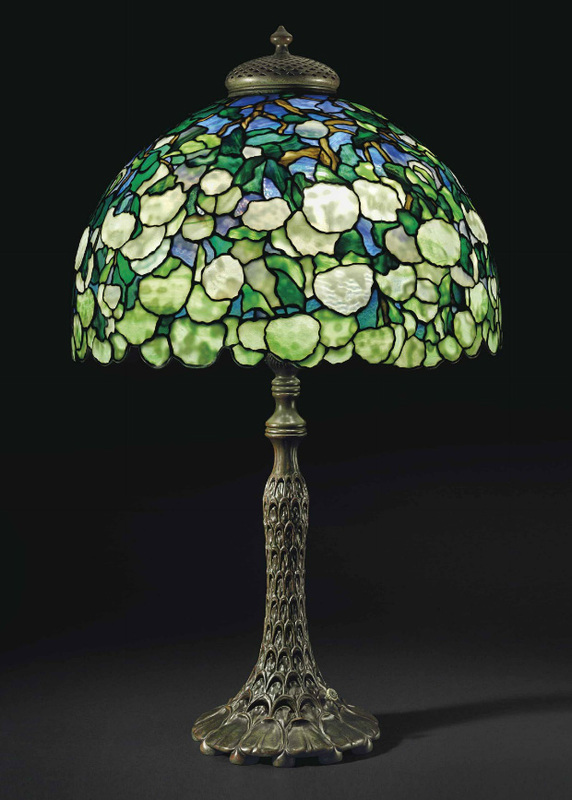 Top lot in the art glass and lamps section of the sale went to #512, a Tiffany Studios 12-light lily lamp, which sold for $25,000, including buyer’s premium, against a pre-sale estimate of $12,000-18,000. The price was strong, considering that four of the shades were reproduction and one of the shades was broken and glued. In addition, the switch was replaced, several of the sockets were replaced, several arms were loose and the lamp needed rewiring. It was not in “ready for primetime” shape. My guess is it sold to a dealer who has the wherewithal to put it back into tiptop shape. The patina was excellent, so it will be a primo lamp when it’s ready. 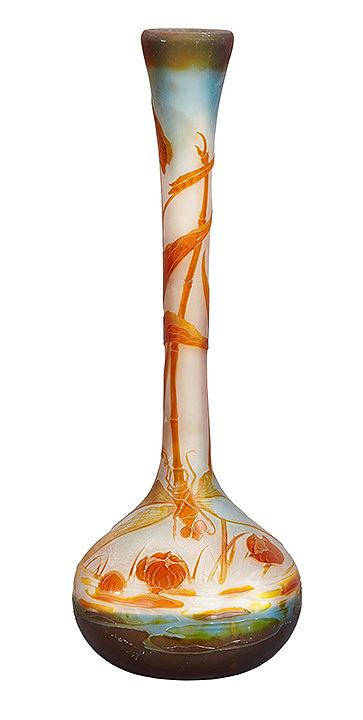 Monumental Galle dragonfly vase, Doyle lot #539. 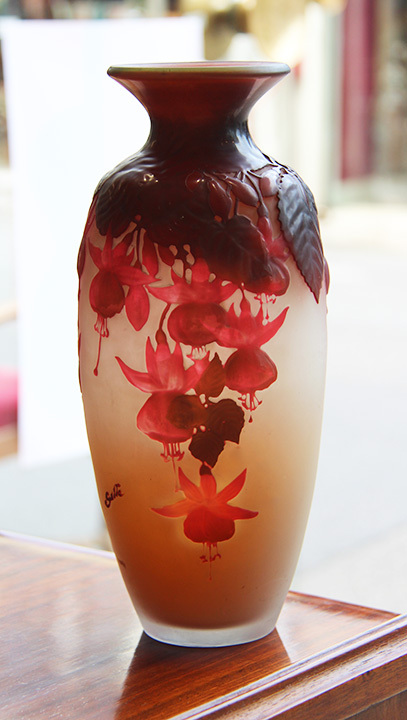 Top lot of the French cameo glass section of the sale went to #539, a huge, 23¼”, Galle dragonfly vase. It sold within the estimate to reach $10,000, including buyer’s premium. Personally I didn’t bid aggressively because the size was too large for me, even though the subject matter was very good. 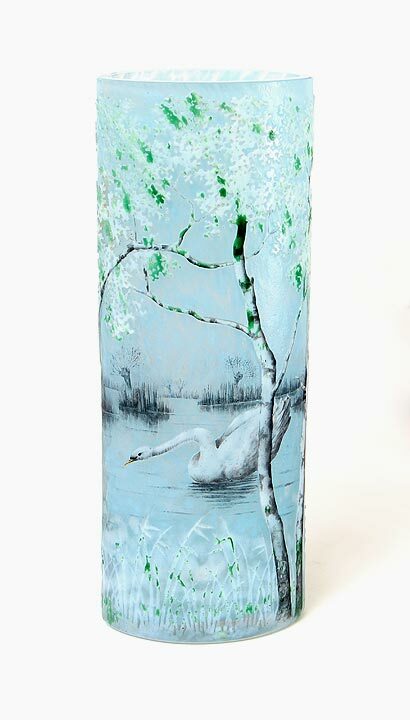 I find it difficult to sell very large vases, as there are fewer collectors who have the room to display them. Lot #544 was interesting. 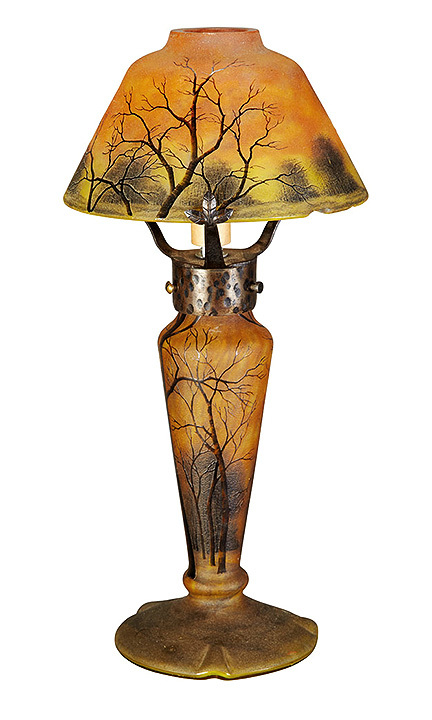 It was a very desirable Daum Nancy winter scenic table lamp. Ordinarily I would have been all over it, but there was significant damage to the lower rim of the shade (which you can see in the photo, on the right). I didn’t bid at all because of the problems. 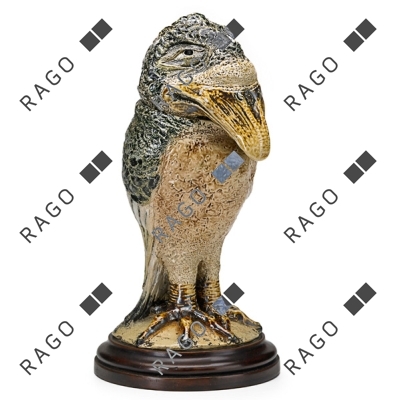 That didn’t stop other buyers who bid the lamp to $8,125, including buyer’s premium, against a pre-sale estimate of $5,000 – $7,000. For the complete results of the sale, click here and then click the gray “view” below. No shows until late July, when we will be in Denver. A fellow dealer convinced me to try the show again. She said the new promoters are good and filled the hall with buyers the last time, so we’ll give it one more shot. In the meantime, don’t hesitate to call or write if you would like to buy, sell or trade. Irene Stella of Stella Show Management conceived of the idea of holding an antique show on New York City’s Hudson River, in a passenger ship terminal. The first few shows were so successful that management expanded the show to include two additional adjacent piers, and changed the name to the Triple Pier Antique Show. The demand from dealers to exhibit at the show was so great, that management further expanded the show to two consecutive weeks, twice a year. That went on for quite a while, until it was ultimately scaled back to one weekend, twice a year. Construction to some of the piers forced the show to be moved to the much larger Pier 94, just north of the original three piers, where it’s been successfully held for the last several years. Fast forward to May 20, 2013, with simultaneous announcements from both Stella Show Management and U.S. Antique Shows, of the sale of three Stella New York antiques shows to U.S. Antique Shows, the promoter of the highly successful Original Miami Beach Antique Show. 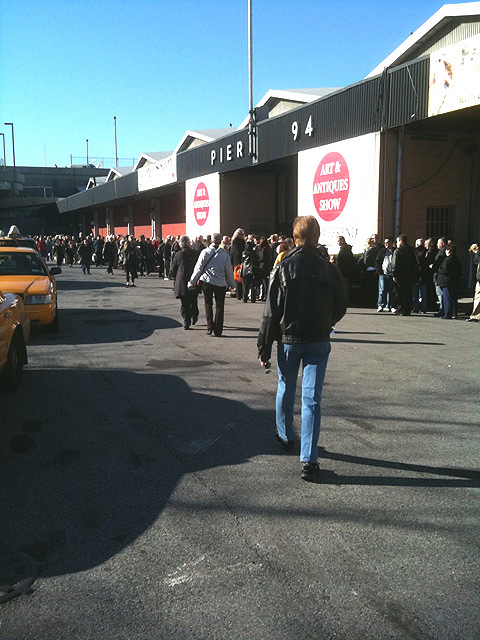 It marks the end of one era and the beginning of another in New York City antique shows. I’ve got mixed emotions. I’ve enjoyed working with the Stellas over the years, but also look forward to the changes new management will undoubtedly make. New blood is usually good for a show, e.g. 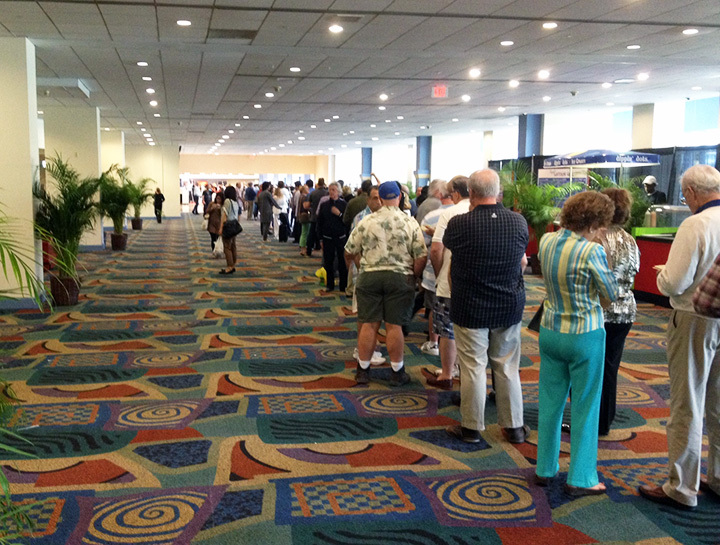 the purchase of the Baltimore Summer Antiques Show by the Palm Beach Show Group. They bought a good show and made it into one of the best shows in the country. Promotion of the show became job #1, which included a significant increase in the advertising budget. That was the start of a virtuous cycle where new buyers attended and new dealers were attracted. I wish U.S. 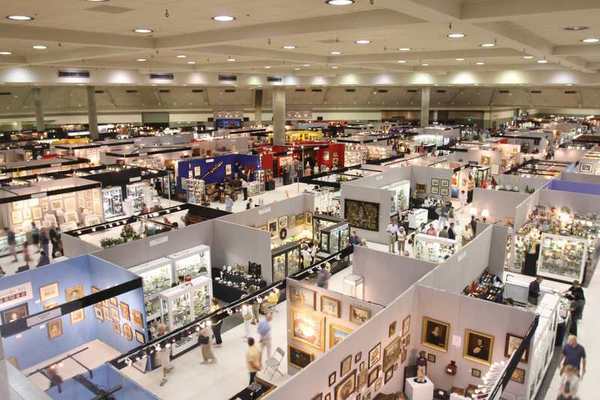 Antique Shows, and its Director of Business Development, Andrea Canady, the same success with their new New York shows. We’re back from our vacation/business trip, so that means two things. First, we have some great new French glass, which I’ve started to list on my website. The rest will be up within the next few days, so please check often. Second, I should have enough time to publish my blog twice a week, so check Mondays and Thursdays. We have no shows until late July, but please don’t hesitate to call or write. We’re always interested in buying, selling or trading.